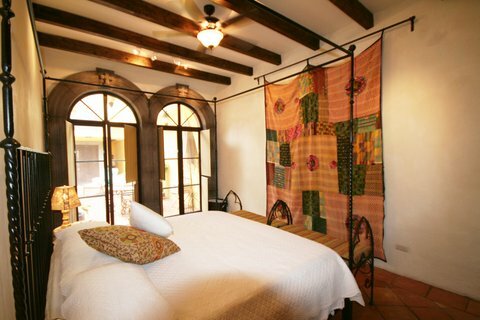 Casa Anna has four bedrooms, best suited for four to six adults and two to four children. 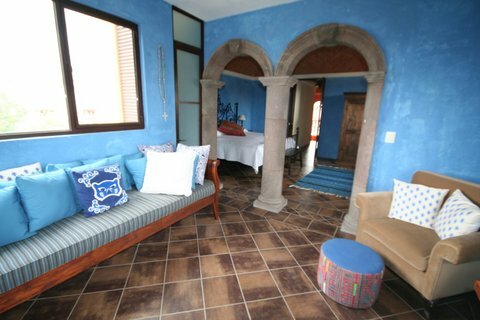 There are two master suites with king size beds: one on the first floor, off the patio, and one on the third floor. The second floor houses two bedrooms: one with a queen bed and the other with two twins. Please see descriptions below of each bedroom. The first‐floor master suite is a fantastic spot for those who don't wish to climb stairs, and who enjoy a large, light-filled bathroom! This lovely room features a custom‐made iron canopy king bed; a large pine armoire; a high, dark‐beamed ceiling; and two beautiful cantera arched windows that open to the patio. Its showpiece bathroom has an enormous, two‐person shower and custom vanity. Skylights above flood the bath with sunshine. Master bath on first floor. 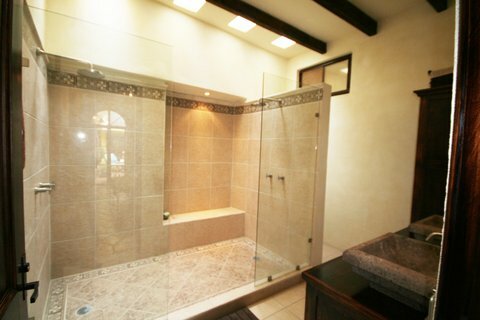 Two-person walk-in shower in master bath. French doors leading into master bedroom from patio. 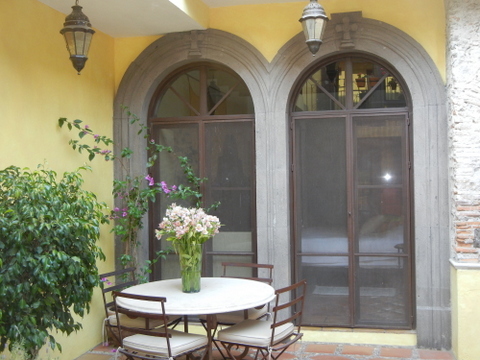 From the bedroom's French doors to the patio. The second floor offers two connected bedrooms sharing a bath. The first bedroom, off of the bar, has a romantic queen‐size bed and gas fireplace. To access the second bedroom, you must walk through the first. So this space is ideal for parents with children, or one couple who would like to have a second spot for reading or relaxing. Its picturesque window overlooks an orchard below of pomegranate and pine trees. The bath these rooms share has a polished-concrete trough sink and a fully tiled walk‐in shower and toilet in a separate room. Queen bedroom with fireplace and doors to twin-bedded kids' room or sitting area beyond. Twin-bedded room connected to queen. The two share the bath. 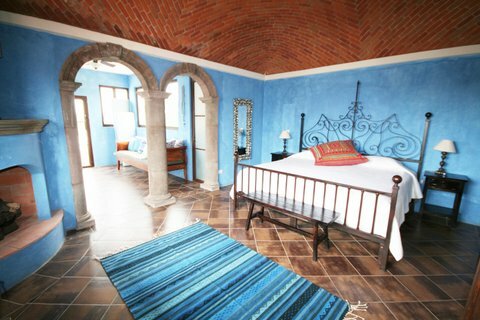 This romantic, sun‐filled hideaway on the third floor has it all: a separate office with desk and daybed (and computer outlet), a beautiful terrace overlooking much of San Miguel, and a bright master bedroom with a king‐size bed, armoire and attached bath. The fully tiled blue-and-white bath has a shower with a large picture window, a pedestal sink and plenty of storage space. From the study looking into the bedroom of the third-floor king suite. King-size bed with gel foam mattress for a heavenly night sleep! Day bed in the sunny den off the master. Third-floor bath with shower and loads of light. The terrace directly off the bedroom's study.